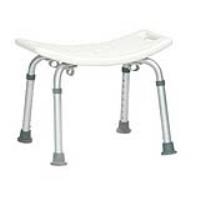 This bath bench is a blow molded plastic seat and back that has drainage holes & built-in handles. The legs are designed and build outwards to resist tipping. There is a 2 year warranty on the frame.